The following is an excerpt from Chapter 1 of Social Media for Social Good: A How-To Guide for Nonprofits. These best practices serve as a foundation for your online fundraising campaigns, but much of your nonprofit’s success also depends upon the service you choose to process your online donations and the design and frequency of your e-newsletter. That said, these online fundraising best practices as well as many others and how to successfully launch and maintain an e-newsletter will be elaborated upon in the upcoming webinar How Nonprofits Can Successfully Utilize Online Fundraising and e-Newsletters. Pundits and bloggers in the nonprofit sector often lament the inability of social media to raise money for nonprofits. It’s true that Web 2.0 widgets and apps have yet to raise large amounts in online dollars for most nonprofits, but that doesn’t mean that social media is not resulting in large amounts of dollars raised online. There is no denying that the rise in online giving over the last few years directly correlates with the rise of social media. While it’s impossible to track these donations unless you poll your online donors, the more your nonprofit utilizes social media to build your online brand and your e-newsletter list, the more likely potential online donors are to discover your nonprofit—and your nonprofit’s “Donate Now” landing page. GuideStar.org is an online database of verified legal nonprofits that helps empower online fundraising campaigns for more than a million IRS-recognized nonprofits. As mentioned earlier, both Network for Good and JustGive.org use GuideStar to empower their giving portals as well as the online donation processing technology of their partners, such as Facebook Causes, Crowdrise, and Jumo. If your nonprofit is a legal 501(c)(3), then it has a profile in the GuideStar database, and consequently on Network for Good, JustGive.org, Facebook Causes, and Crowdrise as well. It’s important that you understand that if anyone donates to your nonprofit on any of these sites, the funds are mailed to the contact information your nonprofit has in GuideStar. Therefore, it’s crucial that you update your GuideStar “Nonprofit Report” at least once a year. The process can be a little tedious, but it’s necessary. If your address, nonprofit name, or mission is incorrect, then it’s also incorrect on Network for Good and JustGive.org’s giving portals and their partner sites. Increasingly, online donors are giving through portals and social networking sites, so you must make sure that your nonprofit is properly listed in GuideStar. Charity Navigator, also a nonprofit, is the best known and most respected independent charity rating service in theUnited States. Since it rates only the largest nonprofits inAmerica, the odds are that if your nonprofit is listed on Charity Navigator, you’ll know it. If it is not, you can request to be reviewed on the service’s website. The Better Business Bureau also reviews national charities through its BBB Wise Giving Alliance program. If you are a national charity, you can also request to be reviewed on this website. GiveWell is another independent charity rating service, although it is much smaller. If your nonprofit is too small to be rated by these services, GuideStar and GreatNonprofits allow donors to review charities. It’s a good idea to ask one or two of your key supporters to register with the sites and leave positive reviews. Studies have shown that “Donate Now” buttons that stand out from your website’s overall color scheme result in more online dollars raised because online donors can’t help but notice them. For example, if your website and your logo use two colors, pick a third color that coordinates well with them for your “Donate Now” button. Again, your “Donate Now” button should be visible and obvious on every page on your website. Design it into your website’s template or navigation bar. Also, space permitting, create and feature donation sound bites that highlight the impact of their donations. The American Society for the Prevention of Cruelty to Animals (ASPCA) highlights that a $35 donation will result in five dogs and cats getting vaccinated and spayed or neutered through its mobile clinic. The Second Harvest Food Bank promotes that a $50 gift provides 180 meals for hungry families, children, and seniors. International Development Exchange touts that a $100 donation initiates a rural women’s organic farming collective inSouth Africa. Donors want to feel that their contributions are powerful. It’s worth noting that these pitches also work well in print materials. In addition to a “Donate Now” landing page, you should also have a page on your website called “Support Us” or “Other Ways to Give” or “How You Can Help” where you neatly list information about becoming a member, monthly giving, gift donations, snail mail giving, workplace giving, planned giving, and so on. Rather than detailing the information on this page, simply summarize it and then link to secondary pages that discuss the various ways to give in more detail. Also, if your nonprofit offers peer-to-peer fundraising campaigns, make sure that you also list “Become a Fundraiser” and link to a page that goes into more detail about creating fundraising pages and launching and maintaining a successful peer-to-peer fundraising campaign. Often donors will click on your “Donate Now” button when they are looking for a mailing address to which to send in a check donation. Make sure that your mailing address is also featured either in the margin or at the bottom of your “Donate Now” landing page. It’s also a good idea to confirm on your contact us page that the physical address listed is indeed where check donations can be mailed, or give another address if it is not. Major donors still predominantly give through checks, so make sure it’s easy for them to find the mailing address for check donations on your website. If your donate now vendor offers recurring donation capability, then launch a sustainer program. Create a page on your website, and perhaps even a print brochure to distribute at events, pitching the importance of becoming a sustainer, that is, a monthly or quarterly donor. The Humane Society brands its sustainers as “Humane Heroes.” Mercy Corps asks supporters to become “Partners in Mercy.” FINCA asks that you join its “Sustainer’s Circle.” Once you draft the content for your sustainer page, promote the program in print newsletters and funding appeals, on your blog, and to your social networking communities. For Web promotions, it’s essential that you have a well-designed graphic that asks supporters to become sustainers. An initial investment of time and resources in creating and launching a sustainer program can result in tens of thousands of dollars raised in online donations over the long run. Similarly, if your donate now vendor offers the ability to donate in someone else’s name, then launch a gift donation program. Again, create a Web page that explains how donors can make holiday and special occasion gift donations in the name of a friend, family, or work colleague directly on your “Donate Now” landing page. Explain clearly that they need to enter the gift recipient’s name and e-mail address for the recipient to receive notification of the gift via e-mail. Highlight how the donation will help your nonprofit and foster social good. If possible, provide the option to snail mail a notification card to the gift recipient. Either buy cards in bulk or get your own designed. Hard copy notifications will increase the number of gift donations given, especially during the holiday season. One of the most common mistakes that nonprofits have made over the years in social media is asking their friends, followers, and fans to “Make a Donation!” before their communities were ready. Build the community first, and raise funds second. For the first few months, don’t ask for any donations. Concentrate instead on finding your voice and nurturing your communities. If you rarely receive comments, thumbs ups, or retweets, then no doubt all those funding pleas begin to look desperate. Inspire first; ask later. On average, limit your fundraising appeals in status updates and tweets to twice a month. If your communities are engaged, then a few people will respond and give. That said, it’s important to remember that you’re much more likely to get online donations from friends, followers, and fans if you can entice them to subscribe to your e-newsletter. After an online donor completes the online giving process, she should land on a “Thank You” page where she is of course thanked for her donation, but also informed that she can stay current on news and progress at your nonprofit by liking you on Facebook, following you on Twitter, subscribing to your YouTube Channel, and so on. Use either text and social media icons or Facebook and Twitter widgets, but not both. It’s also a good idea to create an annual “Thank You” video from staff members and the communities you serve that can then be embedded in your “Thanks for Your Donation” landing page. Similarly, add a Facebook, Twitter, YouTube, or other pitch to your “Thanks for Your Donation” follow-up e-mail. 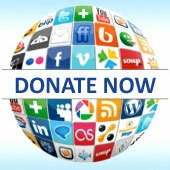 The primary purpose of this e-mail is to confirm the donation and provide donors with a record for tax purposes, but adding social media icons to the bottom of the e-mail with a one- or two-sentence pitch to “Connect to Us!” will help get your donors engaged with your nonprofit on social networking sites. It’s also important to ensure that this e-mail is sent to all donors who give to your nonprofit through giving portals. According to Network for Good, only half of the nonprofits that receive donations through its portal bother to follow up with a personalized “Thank You” e-mail. As a result, those donors tend to drop their giving over time. Portal giving now makes up 25 percent of all giving in theUnited States, so it is a source of revenue that cannot be ignored.